CALIFORNIA TYPEWRITER launches us into the bittersweet moment when a beloved technology, the typewriter, faces extinction. Delivering a thought-provoking view on the changing dynamic between humans and machines, director and three-time Grammy Award® winner and nominee Doug Nichol explores the mythology attached to the classic typewriter, as cultural historians, collectors and various celebrity obsessives (including Tom Hanks, John Mayer, David McCullough, and Sam Shepard) celebrate the typewriter both as object and means of summoning the creative spirit. 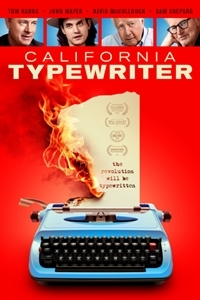 The film culminates in the movingly documented struggle of California Typewriter, one of the last standing repair shops in America dedicated to keeping the aging machines clicking.